Our next stop after a late lunch was the most anticipated of the day - indeed, one of the most anticipated of our entire trip to Bali. 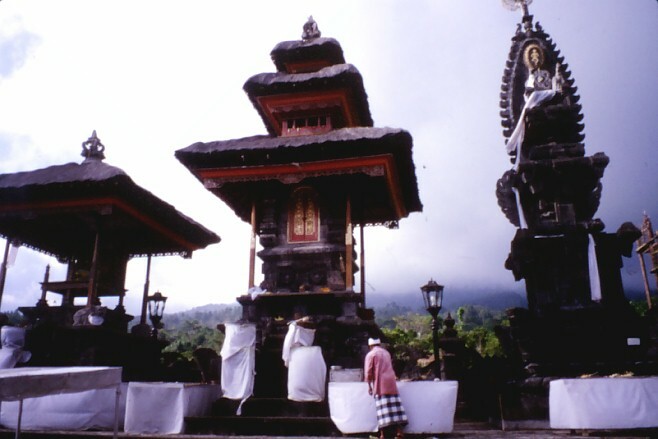 The Mother Temple at Besakih is the most important temple in all of Bali, and we had read about it for years, hardly imagining that one day we would actually be standing at its entrance. We were a little puzzled when Dewa pulled the minivan up just short of the parking lot at Besakih, and explained to us that we would be accosted by many people trying to separate us from our money, and that we should be very wary, starting with the requested "donation" at the entrance. We listened to his advice, hoping that it couldn't be as bad as he said. As we got out of the minivan we paid the entrance fee at the gate. We were then beckoned into a building where we were to pay our "donation to the temple". As you pay, you write the amount in a "visitor's book", and as Dewa had warned us, the people behind the desk were altering the books as we stood there, changing "10,000 Rupiah" into "40,000 Rupiah", and demanding 40,000 since "everyone else was paying 40,000". They scowled at us as we made our donations, and quickly doctored these too as we left. We were not off to a very good start with Besakih. After you leave the money booth, you approach the temple up a long road past a series of tourist souvenir shops selling mostly junk. Finally you arrive at the steps leading up to the temple itself. 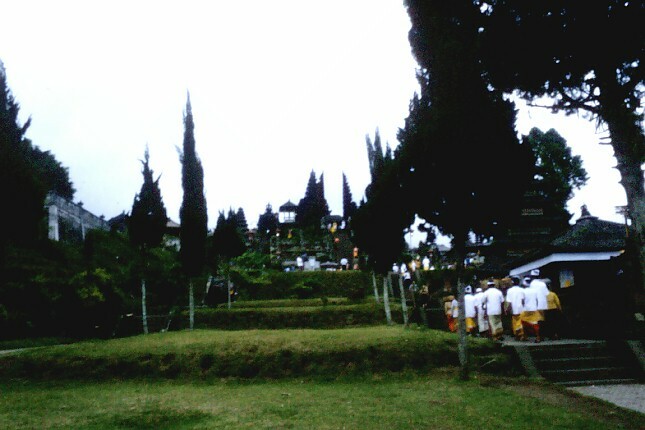 A procession of pilgrims had just passed by - you can see them heading up the steps, all dressed up in white and yellow for the temple. At the top of the steps we found ourselves at the edge of a large courtyard. A small crowd of people were sitting at the front of the courtyard, receiving blessings and holy water from the priests and temple attendants. 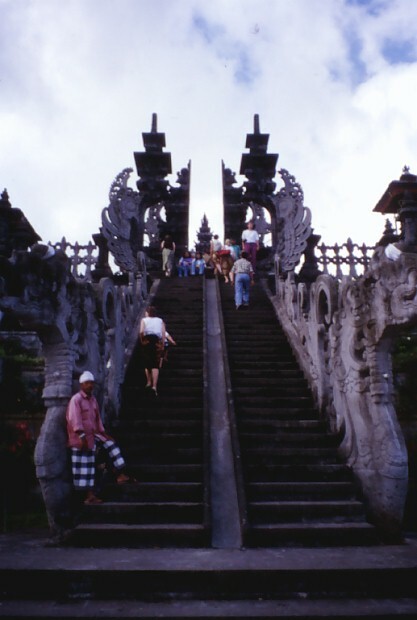 Tall stairways led to higher levels of the temple complex - most of them barred by signs that read 'Hindus Only'. A Balinese man came up to us and wanted to explain what was going on. We listened politely, but when we moved on he kept following us. Whereever we went, he kept following us. This is him in the pink shirt at the foot of the stairs. 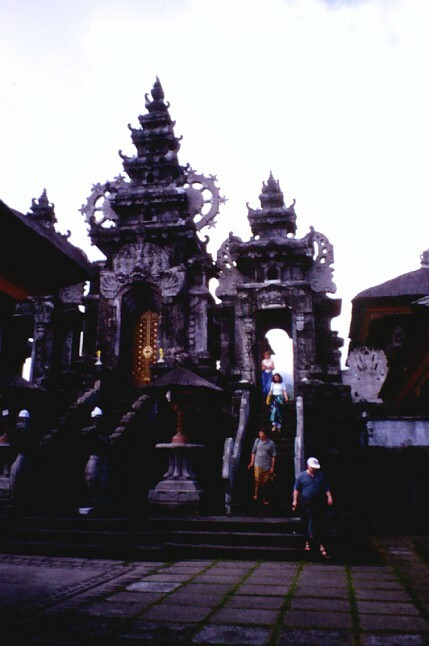 Besakih is huge - there is one temple complex after another, with large courtyards and ornately carved stone gateways leading from one area to the next. 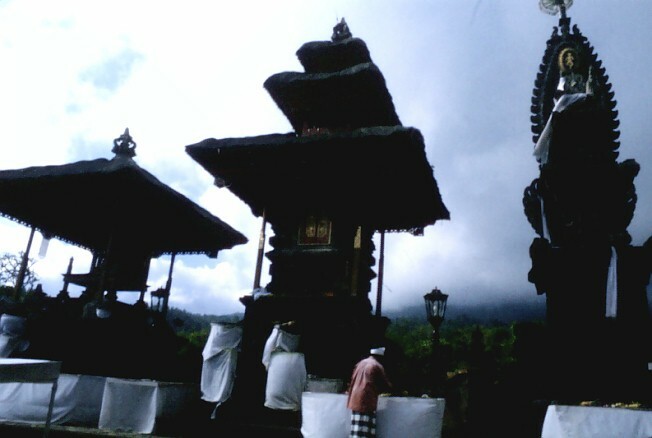 Besakih is situated on the slopes of the sacred mountain, the (still occasionally active) Gunung Agung. 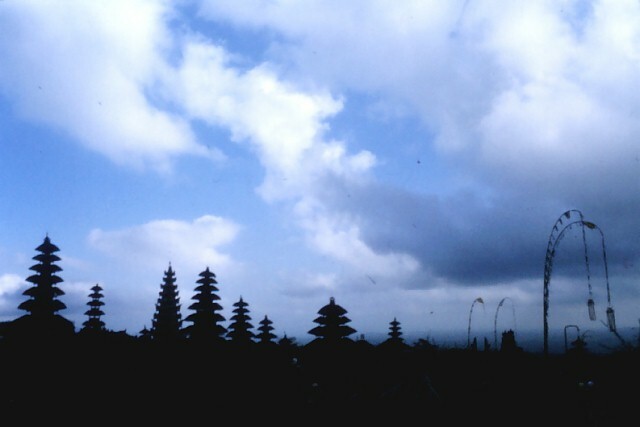 The resulting weather is almost always overcast, which lends an air of gloom to the place. We did see a little blue sky though. 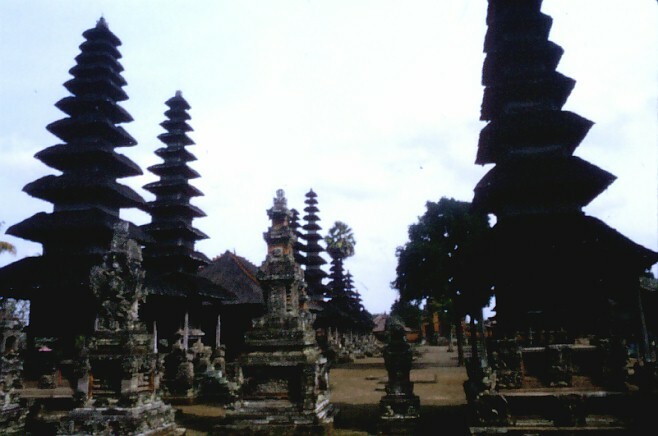 This is a view from one of the upper levels back over the temples. The number of merus and their height show that this is a very important place indeed. More merus... We were beginning to suspect that the 'Hindus Only' signs all over the temple were not so much to preserve the sanctity of the temple, but to preserve the income of the unofficial "tour guides", who waved us through these gates continuously. 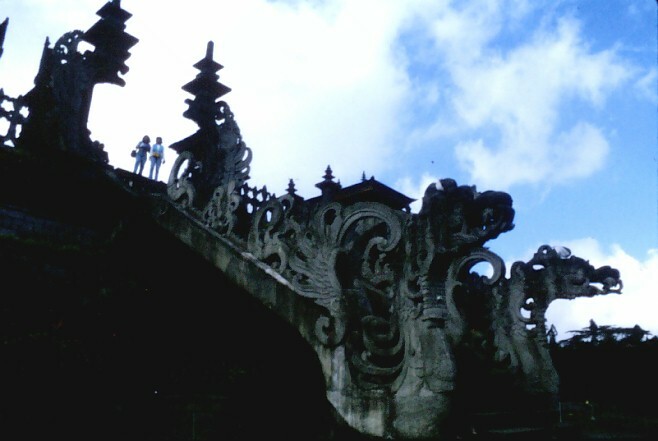 This magnificent stairway is lined by two huge dragons carved in stone. Our "tour guide" was still with us, giving his explanations about the different parts of the temple. How much of this he had simply made up was hard to say - from our own knowledge of the history of the temple, we knew that several things he told us were untrue, so who knew about the rest? At one of the highest terraces of the temple complex, our "tour guide" announced that he wanted to perform a small temple ceremony with us. From a table of previously used offerings, he gave us flowers (also previously used) to hold and after a short "meditation", he sprinkled us with holy water. 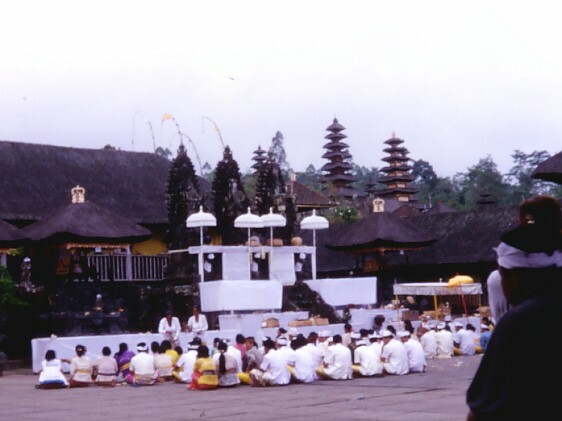 It was nice to have (sort of) prayed at Besakih, but it was a half-hearted ceremony, especially when he then demanded an extortionate fee "for the temple", which we meekly paid, upon which he demanded a similar fee for himself. We paid again since haggling seemed improper in such surroundings. But it certainly took much of the enjoyment and spirituality out of our visit, and we were saddened that such a great temple had become home to a bunch of con artists. The simple joy and reverence of the ceremony at Bangli seemed so much the greater now, compared with the money grubbing and ostentatiousness at Besakih. Back at the minivan, Dewa shook his head as if to say "I told you so" when we told him about our visit. He was sorry we had been disappointed by our time at Besakih, and even though it was late, there was one more place he wanted to take us.